Star Trek 1.29: Operation: Annihilate! “Operation: Annihilate!” is the last episode of season 1 of Star Trek. It took me a while to get to this one, as I knew it would be a bit of a let-down after “The City on the Edge of Forever“. Especially since this is the episode I’ve known ever since I was a kid as “the rubber vomit episode”. But here we go! 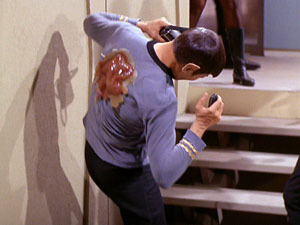 The episode opens with Spock tracing a route through space of a mysterious plague of madness, which has been making a straight line through several solar systems over the past few hundred years (including archaeological evidence of the plague on a planet 500 years ago, before humans went into space). The next planet on the path is Deneva, where Kirk’s brother and his family live. Approaching Deneva, the Enterprise detects a Denevan ship headed straight for the sun. They are unable to use tractor beams to save the ship, as Scotty determines they are out of range by consulting… nothing other than his own psychic engineer abilities. (Really. Kirk asks Scotty if they can use tractor beams, and Scotty turns his head slightly, thinks for a second, then says, “Out of range, captain.” No need to look at a screen or gauge or anything!) They fail to rescue the ship’s lone occupant, but do hear him over the radio babbling incoherently about being “free”. Scans of Deneva indicate the expected human population, but displaying unusually low levels of activity. Kirk, Spock, McCoy, Scotty, and a random yeoman and security guy beam down into a city that looks like a funky technology park campus (which it is). A small group of apparently mad citizens attacks them. After stunning these, the landing party finds Kirk’s brother Sam dead, and his wife Aurelan raving mad and son Peter unconscious. Back on board, Aurelan tells Kirk that the planet was attacked by “things”. Kirk beams back down and the party finds a group of strange creatures lurking in the shadows of a building. Spock declares them “not life as we know or understand it”. They appear to be flying rubber novelty vomits. (In fact Wikipedia says the props are slightly modified rubber vomits.) One attacks Spock. McCoy discovers the creature has injected strands of tissue that have quickly grown into Spock’s nervous system. McCoy can do nothing to remove it, and Spock is left squirming in pain. Spock expresses a desire to be released from bed restraints in sickbay, but Kirk disallows this, having seen how the maddened humans behave. He and McCoy promptly leave, not bothering to post a guard, which allows Spock to escape and attack the transporter chief in a bid to beam down to the planet. Scotty captures him just in time. Spock says he has mastered the pain through mental fortitude and Kirk lets him go down to collect a creature for study – since he can’t risk sending an uninfected person. McCoy discovers the creature is indestructible – nothing will kill it. They speculate, with no apparent evidence, that these creatures originate from outside the Galaxy. They don’t offer an opinion, or even wonder why, they are moving in a perfectly straight line from solar system to solar system. Kirk wrestles with the moral dilemma of either killing the million people on Deneva to stop the spread of the plague, or letting it spread to further planets. He says neither is acceptable and demands a third option. Kirk himself makes the logical leap that sunlight killed the parasite in the Denevan who declared himself free at the top of the episode. A brief experiment confirms that bright light kills the captured specimen. They then expose Spock to light equivalent to proximity to the sun, which kills his parasite, but blinds him. McCoy had raised the option of Spock wearing protective goggles, but Kirk dismissed this, saying that the people on the planet won’t have any. This seems like a weak argument against protecting Spock‘s eyes! Tragically, Nurse Chapel then appears from the lab and says that it was only the ultraviolet component that was needed, not the visible light – Spock was blinded for nothing. Kirk orders a set of satellites launched to bathe the planet in high intensity ultraviolet light – so bright that it will “even affect things in the dark in closed rooms”. I guess they didn’t realise when they made this episode that intense UV light is rather dangerous to humans – or maybe they figured giving a million people melanomas over the next 10 years was worth it. In the denouement, Spock reveals he has regained his sight, thanks to a third eyelid in his Vulcan anatomy that shielded his eyes from the worst. Kirk then tells Spock to lay in a course for Starbase 10 – which is weird, since normally it’d be the helmsman who lays in the course. Tropes: Operation Blank, Excited Episode Title, Apologetic Attacker, Special Effect Failure, Puppeteer Parasite, Idiot Ball, Cardboard Prison, Heroic Willpower, Moral Dilemma, Take A Third Option, Weaksauce Weakness, Kryptonite Factor, Tragic Mistake, Temporary Blindness, Organ Dodge. Body count: George “Sam” Kirk (off-screen), Aurelan Kirk. This entry was posted on Wednesday, 8 December, 2010 at 18:47	and is filed under Star Trek. You can follow any responses to this entry through the RSS 2.0 feed. You can skip to the end and leave a response. Pinging is currently not allowed. OMG- I love this episode. For some reason I have very vivid memories of this episode from when I was a kid. Good stuff, I’m going to have to get this one off iTunes. Retcon Season 1 : In 1966, Paramount Studios did not exist — it came into being with Gulf and Western’s acquisition of Desilu in 1967. Nitpicks aside (and what Star Trek-related project doesn’t attract nitpicks! ), I’m glad you’re enjoying the project. Body count needs updating. You forgot about the Denebian who drove his craft into the sun near the beginning of the episode.